Sysessential for OST to MBOX converter is a unique utility usually used when it is to migrate all the OST files into MBOX file format. Allow email recovery in HTML, RTF and even in Plain text. Sysessential for OST to MBOX tool is an efficient software tool that supports converting complete OST emails into MBOX file format. The entire conversion process takes place in a systematic manner which hardly affects the working of the tool at any point. The utility is perfectly fit for all Windows users as it has high compatibility with all the Windows OS versions. It works with Win 7, Vista, Windows XP and so many more. If you are a professional and want a tool that can make instant migration then this application is worth to invest into. You will be surprised with the functionality of the application the way it migrates emails from one end to the other in smallest possible time limit. For proper understanding of the software, you may try to access the functions in free trial run. The demo will export first 10 emails from all the items into MBOX. You will catch the way regarding tool’s functionality and way software performs data migration. How Freeware demonstration edition actually works? Is software supportive of latest MS Exchange editions? To give ease to users, this application offers complete support to users by simply supporting all the MS Exchange editions. Users hardly come across any hurdles because of inclination for any specific Exchange editions. Is application able to perform instantly? The software supports providing instant email migration task. It performs quick email data migration so that maximum possible time can be saved in the organizational platform. Thus no need to worry; you will be able to migrate bulk data in hardly few clicks. How software is easy to use as compared to other latest tools? While creating the tool, software development team ensure that tool should be useful for all rather than for specific group of users. This is why, it is consisted of advanced technologies but then also, even less techie guys can implement OST into MBOX export with ease. Will the application able to move complete data into MBOX? Yes, users will be able to convert complete OST files into MBOX file format. One can choose the specific emails as well. It is up to one’s choice whether to convert complete data or selected data. Usually email migration is a tough process but you can make it easier with Sysessential. 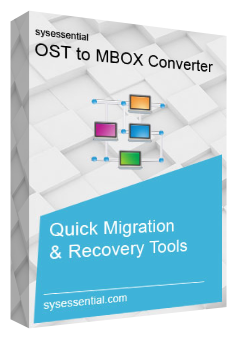 One of the finest products from the company such as Sysessential for OST to MBOX converter resolves the need of migrating OST files into MBOX. Software migrated complete data and does not affect data integrity at all. The results made me happy and contended too. It is worth tool to invest into.